In the 60ties the Americans were hunted by the hippy fever and were lunching slogans against the system. One of them was: Better live thru chemistry , as a direct hint to the tough drug consume. The aid trip was modern, so to say, and everybody who has respecting himself was abusing of it. Everybody was leaving in a heaven of pleasure, in free sexual and religious communities and I believe this is what preceded globalization and its prescriptions: the liberation of the sexes, the egalitarianism, the religious freedom etc. About everything what the survivors of the old habits call today nihilism. I saw yesterday at TV a commercial for an incoming scientific series which is supposed to prove us that man and machine cannot be separated. A series which takes a bet on the man-machine fusion, thus opening the door to a very promising future of the man, who is no longer exclusively from flash and blood... but a mix with machinery. I am sure many of you dream about machinery, about situations where machinery is present and even irreplaceable (to dream for example that you are in an elevator is a dream about machinery). According to physician Hawking, machinery is the absolute novelty. The man-machine, illustrated by his own condition, immobilized by sclerosis in an electric wheelchair, cannot be avoided. When watching Hawking, I have this disgust feeling induced by touching a snake. However, this is what happens when your mind is closed to innovation and progress. What I wanted to say is that the collective mentality shifted from living in the psychedelic exaggeration to the mechanical one. Once upon a time the man survived the day to day life by doing drugs. He was leaving almost continuously in a parallel world, a world induced through delusory chemicals. Nowadays drugs still have power - psychedelic and psychotropic medicine. However, the psychedelic man is a memory. He is followed or replaced by the man-machine. Here we no longer emphasize the exacerbation of the phantasm but the performance. The biological organs are replaced, actually there is nothing left from the old biological formula - everything is mechanically reproduced. The man-machine is undoubtedly the most specific solution of the modern nihilism. He made his first appearance as a book with the Golem (by Meyrink) - a machine as well, if not technological at least functional identical. If the Golem is just a shadow of the man, personified as a demon and a literature topic, the man-machine is the man wired with the machine. So a synthesis of what's best - man and machine - which have to reach the top. The world is no longer seen and looked at through a psychedelic phantasm but through contact lenses which amplify the sense of sight and show us the details up to the quantum order. If at the micro particle level it is no sight of man, why would he still go on in ideology? To see beyond, or through, is the man's ideal and the man of this ideal is the man of the top, the one who goes beyond, or, as it is said, the man who reinvents himself. I draw a parallel between the reptile and the man-machine. The reptile is nevertheless a psyche connected to a set of behavior instructions, called instincts. It can also learn partially and modify essential behaviors, if not even significantly. The man-machine is no longer a psyche, but only essential behaviors, instincts. He basically gets rid of the psychedelic man who lives under the top. The psychedelic performance, the phantasm, is no longer interesting. It does not attract anybody anymore! The man dreams from his first day. The waking or night dream is a part of his mental operation. Freud shows us that the dream has meaning and significance. He teaches us to interpret the dreams and add the extra knowledge to the waking consciousness, to extend the consciousness horizon and thus live less neurotically. Jung introduces us in the Self universe, of the conscious-unconscious totality. It is the extreme of the interest for the psyche. The man-machine does not dream. He does not create phantasms. He does not produce neurosis. He is thus the pure man of the technological ideology which managed to depersonalize by ruling out all differences in the egalitarian and global society. Hawking ideas were speculated in science-fiction series - I remember Star Trek, the episode with the Borg. The man-machine in his entire splendor and, above all, the man-machine in the society-for-all. 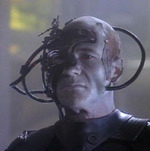 Borg was threatening captain Picard that he would be assimilated. Picard says: I will resist! Borg replies inflexible: Resistance is futile!